Doorbells are a necessity in every household, and wireless doorbells are a lot more practical, convenient and stylish compared to traditional wired chimes. Aside from these aspects, the best wireless doorbells can offer you a whole lot more functionality, some can even serve as a surveillance system. And with video models you can see who is on the other side of the door without peeking out the window or through the peephole. Head on over to our Ring Doorbell Comparison to find out more. Most importantly, they are more reliable and a whole lot easier to install and setup than wired doorbells. Before buying a wireless doorbell for your home, it is important that you consider some factors to ensure that you will get the right one for you. The first consideration is your budget. There are a huge amount of manufacturers claiming to offer the best and it can be overwhelming to narrow down the options to make your purchase. But, if you keep a budget in mind and a list of features you require from the device, choosing the right one to buy becomes a whole lot easier. If you want something that is affordable, it is still very likely that you will find a wireless doorbell that has a lot of great features. 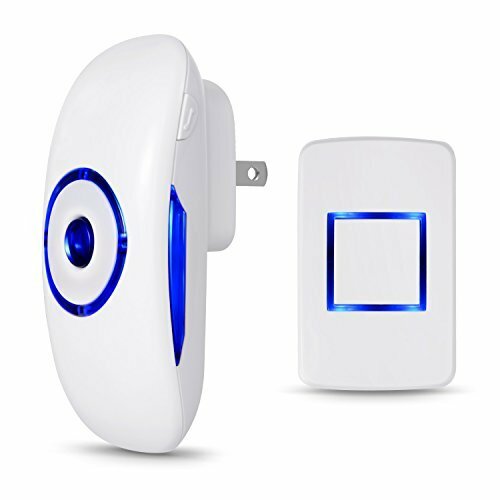 However, if you are looking for a more decorative wireless doorbell or something that has more advanced features and other perks, then you must also be prepared to pay a little bit more. Speaking of the features, your second consideration should be the quality and the features of the wireless doorbell system. Most have the basic doorbell buzz, but there are some which can allow you to upload your own customized sounds. There are also those which have WiFi capabilities, camera, intercom system, and other advanced features, so you also have to decide if these are features that you need to have. Then, once you have identified the features that you want, go back to your first consideration, which is the budget. You also need to carefully choose the style, to ensure that the color and the overall appearance will go well with the style of your house. Make sure that it complements your house’s facade and blends well with the surroundings. Lastly, make sure that you choose a wireless chime that has a warranty. This will be your protection in case something goes wrong with the unit or if it does not work at all, so you are armed with the returns policy details on how it can be repaired or replaced. AVANTEK makes the cut and gets our Editorial Team Top Pick as one of the best doorbells in the market today because of its excellent features at a very attractive price point. This goes to show the brand knows what they are doing and that they are definitely designing products that are aimed to make your life easier. It is waterproof, dust-proof, and can hold up even in extreme weather conditions with an IP44 protection rating, making it perfect for the outdoors. It has 52 different chimes, which can be chosen just by pressing the next or previous button. It delivers a crisp and clear sound with its 40mm speaker. The volume can be adjusted to 5 levels up to 115 dB at maximum volume and also includes a silent mode with a flashing LED alert. It has a wireless range of 400 meters or 1,312 feet and will not with interfere other equipment at your home, so you will no longer experience answering a ring that is not really intended for you. It has a memory function, so you can save the last setting after a power interruption. The package comes with a transmitter and battery, 2 plug-in receivers, adhesive tape, a couple of screws and anchors, and a user manual for easy installation. It has low energy consumption, while giving you years of reliable performance. The melodies range from the classics to songs popularized around the world so you will not get tired listening to the sound of your doorbell. It has a frequency code that is unique to each unit, this means your doorbell won't randomly ring due to interference when your neighbour opens their garage door or some other device in your house is competing to use the same frequency - possibly the best feature! It consumes only a small amount of energy. It is very easy to install and set up as it does not require any complicated wiring. It looks good and will fit any decor and comes in either black or white colors. The 2 receivers are a plus, because they allow the doorbell to be heard anywhere in the house. The LED light indicator is a bit small and might not easily catch attention for those with difficulties with their sight. Although the 52 different chimes are fun to have, it can take time to choose since you have to go through all of them. The water-resistant unit can malfunction under extreme conditions. 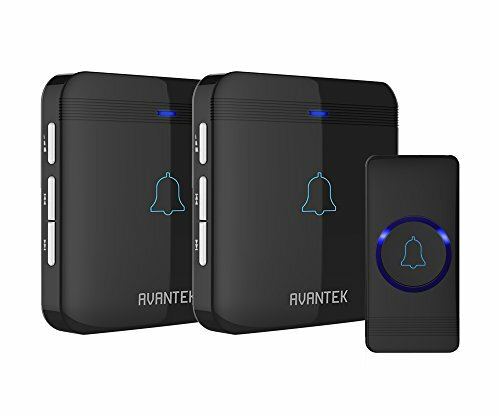 Avantek has done a great job with its Wireless Doorbell Kit. What makes it great is the unique frequency code feature which ensures that you avoid interference from your neighbors or other devices in your home. And with two receivers installed in different parts of your house, you will no longer miss anyone that rings from your front door. Should you find you need more receivers over time, additional units are available from AVANTEK. Ultimately it may not be the cheapest in its price range but we think the benefits outweigh this, after all, if you're investing in a wireless doorbell system for your home, this product will give you great value for your money. SadoTech’s Model C Wireless Doorbell is one of the brand’s top-selling products among its line of doorbells and is considered to be most suitable for those living in apartments or bungalows. It is a smart choice for homeowners because of the great features discussed below. Operating range of over 500 feet. (1000 feet in open area). Remote transmitter button is rated IP33 weatherproof and acceptable for outdoor use. Easily plug receiver into an electrical outlet (no batteries required for main receiver). CE, FCC, RoHS certified. It is made of ABS plastic, which is a very durable type of plastic. It has a modern look, with a sleek white finish and an additional accent of blue LED lights on the chime unit and the push button. It has dimensions of 3.2 x 1.5 x 3.5 inches, which makes it efficiently small and compact. It has a high-quality audio speaker, which makes it easy for the doorbell sound to be heard clearly anywhere in the house. It features 52 different chime options, which can be customized for each receiver. The volume can be adjusted from 25db to 110db. It has an IP33 rated weatherproof remote transmitter or push button, which makes it suitable for outdoor use. It only requires one 12v 23A battery for the push button, which is already included in the package. Its main receiver does not require any batteries. It has a range of more than 500 feet or even up to 1,000 feet in an exposed area. Installation is very easy as the anchors, screws, and double-sided adhesives needed are already included in the package. It is perfect for a small to medium sized home. It can also be used as a device for paging alert, which can be useful for the elderly. The sound may not be loud enough for larger homes or longer range. The push button needs to be held down for a few seconds before the receiver recognizes it. Overall, the SadoTech Model C Wireless Doorbell is a good choice, with its many useful features. It has the capacity to send off an audible or visual alert, which a lot of people appreciate. It is reliable and fits the needs of small to medium homes as well as small establishments that are in need of a doorbell or a paging system. Wireless and portable are just two of the features that most people look for in a doorbell and this one from Adoric Life (formerly known as Boomile) may just be the one that you are looking for your home. Aside from the two mentioned, this product also has other great features such as those discussed further below. It has a working range of 1,000 feet or 300 meters and an operating frequency of 433MHZ. It is wireless and portable, so you will not miss anyone dropping by, as you can hear the ring anywhere you are in the house. The volume can be adjusted in 4 levels, ranging from 20 dB to 80 dB. It has 36 varieties of rings. It also has a visual alert in the form of a flashing light, so that it can also be useful for people who are hearing impaired. It can also be used as an alert device. The transmitter or push button is waterproof, so it can be used outside. Just make sure that you let it air dry if it gets wet from heavy rain. The transmitter uses a 12V Alkaline Type A23 battery. The receiver does not require batteries as it needs to be plugged into an outlet. It is so easy to set up and install that it can be ready in just a matter of minutes. It has a clean and modern design, which can fit any modern home style. It has a lot of options for chimes like the traditional ding-dong or a barking dog. The blinking blue LED light is quite hard to miss. 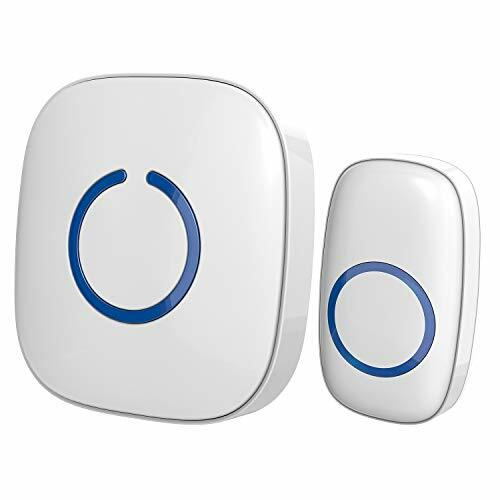 There are many wireless doorbells available in the market these days, but what makes this Wireless Doorbell stand out is that it is portable, which means there will be no more missed visitors anywhere you go in the house. It is also great hearing impaired doorbell for those with auditory impairment, providing a visual alert via its flashing LED light. This product is one of the best wireless doorbells in terms of its wide range coverage. 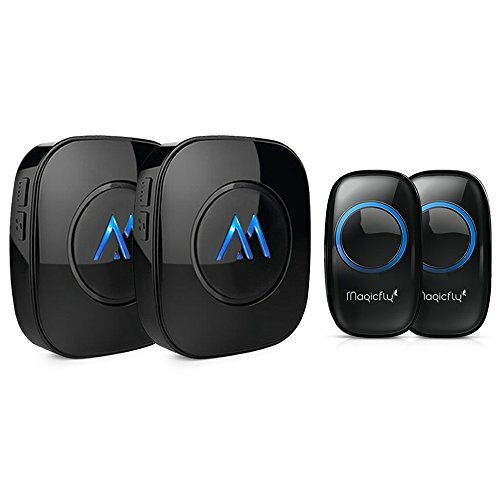 The Magifly Wireless Doorbell is preferred by many because of its great features, which include the following. It can cover a range of up to 1,000 feet or 300 meters, so it is ideal even for houses with multiple floors. In semi-closed areas, it can cover a range of up to 200 meters. It comes with two transmitters as well as two receivers. It is made with high-quality materials, which prevent it from becoming overheated as well as prevents interference from other equipment. It has 52 different chimes and melodies and an adjustable volume, ranging from 25 to 100 decibels. It has a stylish design and a sleek black color. It is certified by RoHS, CE, and FCC, and has a waterproof rating of IP33, which makes it suitable and safe for outdoor use. It has an option for power saving mode. It comes with a double-sided adhesive and 4 screws, so it can easily be installed in any way you want it. The package also includes a couple of 12 volts 23A batteries and plastic rings. The transmitter has low power consumption, consuming only less than 12 volts. It also has different lighting modes, such as no light, flash and ring, ring down, and constant light and ring. It passed certifications from RoHS, CE, and FCC, which makes it one of the safest on the market. It is convenient and easy to install. The chimes do not have a quality sound for such a modern piece of It sounds like listening to tunes from the 80’s. The Magicfly Portable Wireless Doorbell Kit is another great consideration for your home, especially if you live in a multiple stories building. You can install one receiver at ground level and another one at the second level so that you will not miss any visitor ringing at your door. However, if you are very particular about the sound, you might want to check it first because of the feedback that the chimes seem to be of low quality. When it comes to buying a wireless doorbell for your home, there are several things that you need to consider to ensure that you will only buy the best one for you and not end up wasting any money buying the wrong one. Check the installation, the parts that come with the package, as well as the energy consumption. If there are special needs such as if anyone in your house has a hearing impairment, you should consider that as well. Fortunately, the products that were mentioned and reviewed here all have excellent features, so you will not have a hard time choosing which one to buy. Look at the pros and cons of each product and determine the features that you need, before considering what you want. While these wireless doorbells are all great in their own ways, the compatibility and suitability still depend on your home setup. For instance, do you live in a small bungalow house? If yes, then you probably will not need two receivers. However, if you live in a multiple story house, it is best to get something with two receivers so you can sync them together to make sure you still hear the doorbell ring wherever you are in your home. Ultimately this is why we've chosen the AVANTEK as our top pick; it's available at a very attractive price point for the features provided and will fit most user requirements.